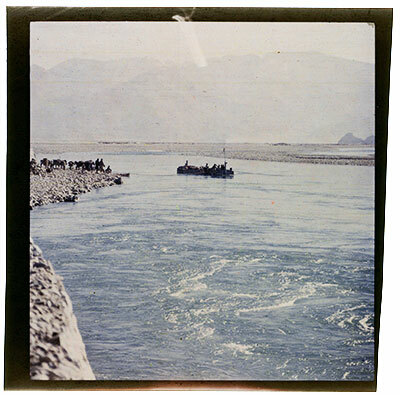 Laden ferry boat on the the swirling waters of the Kyichu river at Ramagang four miles south of Lhasa onnthe Kyichu river. There are people with animals waiting on the bank of the river on the left. The ferry is flat-bottomed and the prow, in the shape of a horse's head, can just be seen. The Tibet Album. "Ferry boat at Ramagang on the Kyichu river near Lhasa" 05 Dec. 2006. The Pitt Rivers Museum. <http://tibet.prm.ox.ac.uk/photo_2001.59.8.88.1.html>.